I've owed young Harry in the village a wargame since his Mum bought one in the school charity auction a year ago. Given a choice of subjects, Harry picked "Star Wars spaceships", the game to be played with his friend Leo. 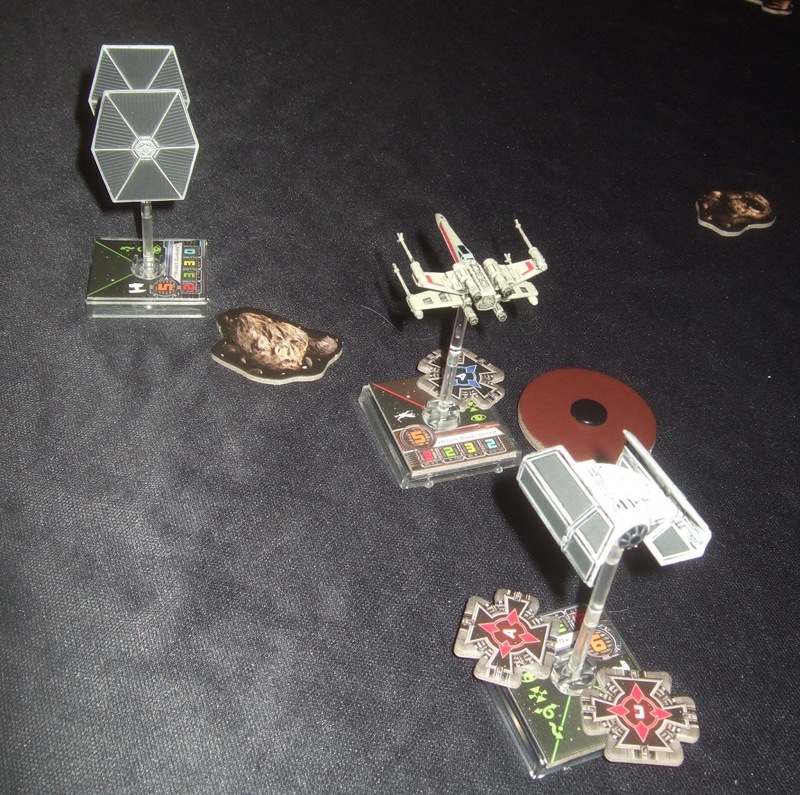 As I was introducing the rules for the first time, we started with a relatively simple game featuring just the three ships in the starter pack - two TIE Fighters and an X-Wing. I wanted to simplify things slightly. I didn't go as far as to use the start-up rules in the boxed set as I think they simplify too far but I did leave out critical hits and I made sure there were no pilot abilities to confuse things. The TIE Fighter pilots had no abilities at all and the X-Wing was piloted by Biggs Darklighter, whose special ability has no effect when his is the only Rebellion ship in the game. After a quick teach-in on the rules we got started with Leo representing the Galactic Empire. Victory went to Harry in about an hour and a half. The lads then swapped sides as we introduced some more ships, some better pilots and the full combat rules. Harry had two TIE Fighters (Dark Curse and Winged Gundark) and Darth Vader in a TIE Advanced. Vader's ship carried a concussion missile. The Rebels fielded Biggs again, joined by Luke Skywalker (with R2-D2 in the astromech mounting). Darth started with a head-on pass at Biggs. He fired off his missile and managed to strip off Biggs's shields. The action then developed into a confused melee and eventually Vader's ship was seen tumbling off into the blackness of space. Another win for the Rebellion! Both of the lads enjoyed the game greatly. I suspect I know what's going to be on some Christmas lists this year!